China’s digital economy will overtake the traditional economy by 2021, according to a report by market research company IDC China, by which time it will account for 55% of the country’s Gross Domestic Product (GDP). What this means is that there’s a canyon of opportunity waiting to be filled by tech and digital startups to really drive forward economic growth in the world’s second-largest economy. The digital economy is currently being led by the country’s three powerhouse conglomerates Baidu, Alibaba, and Tencent, known collectively as BAT. In 2016 they accounted for 47% of venture capital investment in China. McKinsey & Company reported that China’s e-commerce market is also the biggest in the world. This is largely down to the business savvy mind of Alibaba CEO Jack Ma—an alum from Beijing’s Cheung Kong Graduate School of Business (CKGSB). Members of the 10,000-strong CKGSB alumni network lead one-fifth of China’s most valuable brands. On CKGSB’s 14-month, full-time MBA program, students who wish to embark on a journey into the digital world in China can focus on electives in Entrepreneurship, and Venture Capital & Entrepreneurial Finance—educating students on how to make smart, business savvy decisions when dealing with nascent startups. The CKGSB full-time MBA also incorporates a China-specific module into its program, schooling students on Valuation and Investment in China, and taking them on company visits to firms like Baidu and Lenovo. 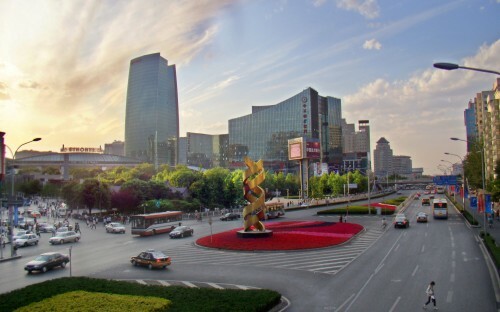 Those two companies were born out of Zhongguancun, a tech park located in the north-western part of Beijing, and China’s answer to Silicon Valley. Over the past two decades, the site has gathered nearly 20,000 high-tech firms, including tech-giants Weibo and Youku—it is a major factor in Beijing’s recognition as one of the world’s burgeoning startup hubs. Further, China is in the top three nations in the world for venture capital investment in areas such as virtual reality, autonomous vehicles, and artificial intelligence. In May this year, it was reported that the region’s VC investment had totaled $56.44 billion, an increase on the year before of 132%. Demand, therefore, is clearly in the ascendency, and although the country’s non-financial debt—household, corporate, and government debt—is estimated by the International Monetary Fund to reach 300% of GDP by 2022, business confidence year-on-year has proven healthy. In September this year, CKGSB’s Business Confidence Index (BCI), directed by Li Wei, a professor of economics at the school, hit 62.4—painting a rosy picture of the Chinese economy. The index polls Chinese executives on how they feel about China’s macroeconomic environment—they are asked to deem whether their businesses are optimistic about a variety of economic factors over the coming six months. China’s economic growth, therefore, should be “smooth”, Li explains. GDP growth year-on-year reached 6.9% in the first half of the year, which Li says translates to the Chinese economy well on track to hit the growth goal set by the government for 2017. An increase in business demand nationwide can be seen in the Xiong’an New Area—a zone 60 miles southwest of Beijing formed on the back of the Chinese government’s plans to combine the counties of Rongcheng, Anxin, and Xiong into a hub of high-tech innovation and sustainable development. Among the initiatives there, a new science and technology park will offer 300,000-500,000 of Beijing’s most talented residents the opportunity to relocate and revolutionize the area. Opportunities are rife for MBA students from Beijing’s CKGSB to venture into the tech-startup world.